Do you often feel a burning sensation on a part of your tongue, the insides of your cheeks, or on the roof of your mouth? Stay safe, because you just might be facing the initial signs of mouth canker sores. Stress is one of the most common causes of mouth canker sores. Mouth canker sores usually start out with these minor symptoms, and later manifest as painful ulcers. Doctors call these sores “aphthous ulcers” to distinguish them from cold sores that appear on the lips or along the outer edges of the mouth. Adolescents are more likely to develop mouth canker sores as are people who suffer from excessive stress. How Do Mouth Canker Sores Form? 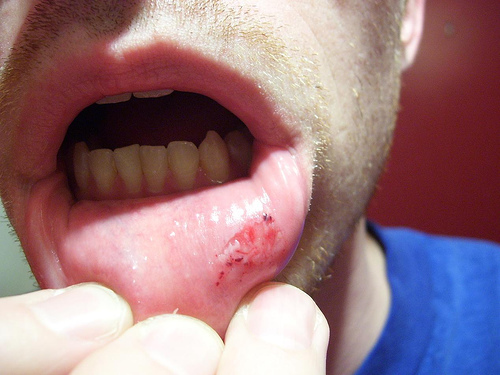 While the precise cause behind such sores is not clearly known, it is an accepted fact that some forms of tissue injury or stress can lead to their formation. The consumption of acidic vegetables or fruits such as tomatoes, citrus fruits, pineapples, and strawberries may trigger the appearance of mouth canker sores. Dentures that do not fit well or teeth braces may also lead to canker sores, and sometimes, the sharp edge of a tooth may lead to injuries that result in these sores. The human body needs a lot of vitamins and minerals in the right proportions to keep functioning normally. These nutrients play a major role in the metabolic cycles and therefore, a deficiency of these may lead to certain conditions – of which, one is mouth canker sores. Many people with nutritional deficiencies – especially of vitamin B-12, folic acid, zinc, and iron develop canker sores. Similarly, those with celiac disease, immune system-related disorders, or Crohn’s disease may also suffer from such painful sores more often than people without such disorders. Physical exhaustion or mental stress are likely to set off mouth canker sores. Women undergoing their menstrual cycle and teenagers are also more likely to develop these sores. Sometimes, a food allergy may be the cause of these sores too. Mouth canker sores are often confused with cold sores, but the major difference between the two is the location of the sores. While canker sores typically appear within the mouth cavity, cold sores are almost always located on the outside – on or around the lips or below the nose or chin. Cold sores are blisters that are filled with liquid and because they are the result of a viral infection, they can easily spread from one person to another. Mouth canker sores do not spread in this manner, as they require a trigger from within the person’s body to make an appearance. Mouth canker sores may not have serious medical implications but they can be painful, to the extent where they can impair a person’s ability to eat and speak. While the exact cause of these canker sores is unclear, there is at least some information available about what can trigger them. By avoiding these triggers, it is possible to reduce their incidence and avoid the discomfort that they cause. This entry was posted in Canker Sores and tagged canker sores in mouth, mouth canker sore by Dr. Sandeep Reddy. Bookmark the permalink. Dr. Sandeep Reddy (BDS) is a Dentist at Shifa Dental Care, Bangalore. A specialist in Endodontics, he has one year of medical experience as a Dentist.